Sound advice from Michael Hagedorn, bonsai expert and consultant to the Portland Japanese Garden. Hagedorn laughed as he answered light-hearted questions by curious onlookers – while trimming the spring shoots off a 500-year-old Rocky Mountain juniper tree. “That student wears gloves when he works on it; he’s got a great sense of humor. But really, unusual things like grapevines can be made into bonsai, all sorts of deciduous trees are great, and there are many species of conifer trees, too,” he said. Bonsai came from China, originally known as penjing. As with many art forms, the Japanese practice of Bonsai took a more subtle and quiet approach. 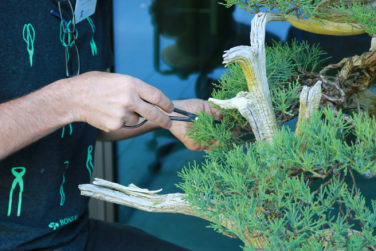 “Bonsai is an artfully designed tree meant to emulate a scene in nature,” said Andrew Robson, one of Hagedorn’s students. Robson added that the size of a bonsai correlates less to age and more to the species used to create it. He quotes James Thurber from the The Secret Life of Walter Mitty when he reminds us that “Beautiful things don’t ask for attention.” Fashion, paintings, architecture, he said, these are things that ask to be noticed. Often they are designed specifically to be noticed and admired. “Bonsai are the opposite. Their beauty is in their subtlety. They follow the principle of wabi sabi, starting first with their chosen pot. The patina of a good, weathered pot tells the story of age and use, through the water, the fertilizer, and the dirt that has accumulated on it over the years,” said Robson. Hagedorn’s apprentices like Robson re pot a bonsai every few years to keep it looking youthful. “Japanese people have a profound appreciation for the ephemeral, illustrated in their love of cherry blossoms. Ironically though, bonsai is their perfected art form that defies this,” said Robson. 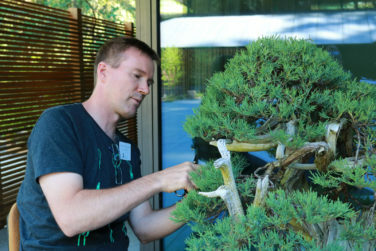 There are nine different bonsai lenders in the Ellie M. Hill Bonsai Terrace this year, and most are from the Portland area, Hagedorn said. The Garden will rotate a few species out occasionally, as some are seasonal. 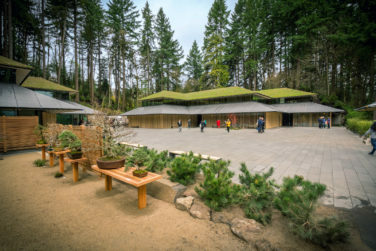 In the winter, the Portland Japanese Garden will be rotating in hardier specimen. 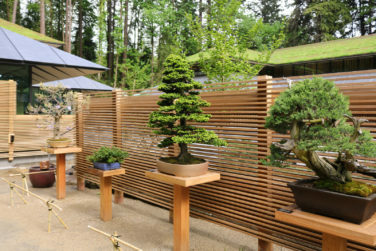 There are three additional bonsai located in the Jubitz Oregon Terrace with accent plants placed on shelves along the stucco wall to “give a hint of seasonality,” Hagedorn said. Two informal bonsai demonstrations are planned outside the Lemelson Garden Studio on Tuesday, August 15 and Wednesday, August 23rd during regular Garden hours. The art of bonsai, the creation of a miniaturized landscape that fulfills the human yearning for a connection to nature in the smallest of spaces, is on display at the Garden with rotating seasonally resplendent specimens.